PM Modi on eve of 31st Dec 2016, while addressing the nation announced about the new scheme called BHIM (Bharat Interface for Money), named after Babasaheb Dr Bhimrao Ambedkar, the architect of the Constitution of India. BHIM is the latest unified app for UPI (Unified Payments Interface) which will allow the users transfer money to anyone with a UPI-enabled bank account, or even a regular bank account through IFSC code. UPI, as a payment system was first announced in April 2016, by the 'National Payments Corporation of India' (NPCI) along with the Reserve Bank of India. While mobile wallet companies like Paytm and Mobikwik made great business cashing in on demonetization, UPI didn't get that much of a push. However, BHIM now compensated this anomaly. BHIM will let you send and receive money to other UPI accounts or addresses. You can also send money via IFSC (Indian Financial System Code) and MMID (Mobile Money Identifier) code to users who don't have a UPI-based bank account. There is also the option of creating your own QR (Quick Response) code for a fixed amount of money, which the merchant can scan to make the deduction. BHIM has distinct new features than a normal mobile wallet like PAYTM or MOBIKWIK. You can store a limited amount of money in a mobile wallet, which you can send to only someone who is using the same wallet. But BHIM since UPI-based and thus linked directly to a bank account. All that a payee needs is a bank account. If this account is UPI- enabled, you can just ask for the payee's VPA or Virtual Payment Address and make that payment to that account directly. The advantage is that there's no need to remember an account number, or to share with anyone. The VPA is all that is needed .Up to Rs 10000/- can be sent per transaction and up to Rs 20,000/- in any 24 hours. Your preferred bank can be used for BHIM, after it has verified your mobile number. You get an SMS, so it's best to use the same number as the one that's linked to your bank account. BHIM will ask you to set a 4-digit pass code. The App will then ask you to select your bank. If your account is UPI activated, it will reflect the relevant number. You will see options to send and receive money, and transact via IFSC. If UPI is not activated, you can put in six digits of your debit card number, and the expiry date, after which the App will let you use it. Right now the App is only available as an Android App, which can be down loaded from Google Play Store. The IOS users are out of the system. The Apple i-Phones will also be brought to BHIM soon. BHIM App has three levels of authentication providing high degree of security. For one, the app binds with a user's mobile number. Secondly the user needs to sync whichever bank account (UPI or non UPI enabled) needed to conduct monetary transactions. Thirdly, when the User sets up the app, they are asked to create a UPI PIN. This PIN is what is finally needed to complete a transaction. Further, it is needed every time you need to log into app. "There are three factors of authentication versus a normal net banking app or a chip- pin debit card which will only have two levels of authentication"- points out Modi. The safety precautions ensure that even if your mobile gets stolen nobody can transact until they know your UPI pin. Even if someone does some fraud and gets your documents and duplicates your SIM, to access your device, they won't be able to transact because they won't have the UPI pin to access the app. 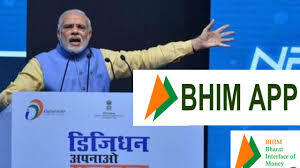 BHIM has been launched by Govt. to give a push towards digital economy. It also means that for smart-phone users, there is now a government-authenticated app to carry out payments, without always having to rely on third party players. However, right now BHIM app is facing teething troubles. The Internet is spotty or non-existent across vast swathes of the land. NPCI's official Twitter account for BHIM app tweeted earlier saying that they have a high server load, due to which they are facing intermittent issues. The tweet announced that NPCI would be releasing a new version to resolve this issue. Let us all hope that 2017 is going to be a happening year to steer the nation towards a cashless economy there by ushering monumental economic growth rate.